India's Defence Research & Development Laboratory (DRDL) plans to extend the range of the HELINA (Helicopter-mounted Nag) anti-armour missile into a >20-km range strike munition for combat aircraft and helicopters. HELINA project director KS Vara Prasad has indicated that his team is building a "miniaturised inertial navigation package" to enhance the existing weapon without adding weight or too much cost. 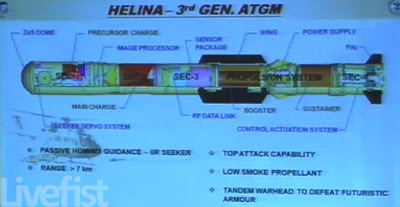 The HELINA, an air-launched variant of the Nag anti-tank missile, has a range of 7-km and has been captive flight-tested, with a scheduled first firing for later this year. The programme director has also revealed that a feasibility study is officially on to integrate the HELINA onto the Rustom-H MALE UAV. More details soon.